The Maintenance Inspection Vehicle MIV 1-25 is designed for use on monorail system for track inspection and maintenance work. The MIV provides a vertical support work platform and horizontal work decks equipped with lifting and jib devices. The electric power needed for operation is produced by a power generation set. In order to reduce exhaust gas emissions, especially during operation in tunnels and viaducts, the power generation set diesel engine has an exhaust gas cleaning system. The MIV can be driven from two driver consoles for each driving direction. The movement data are displayed on the gauges on the control consoles. 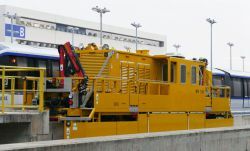 The Maintenance Inspection Vehicle provides a radio system that can be used in trains. An intercom system is also provided for communication between the driver cabins. VATC - vehicle automated train according with customer network is also provided.